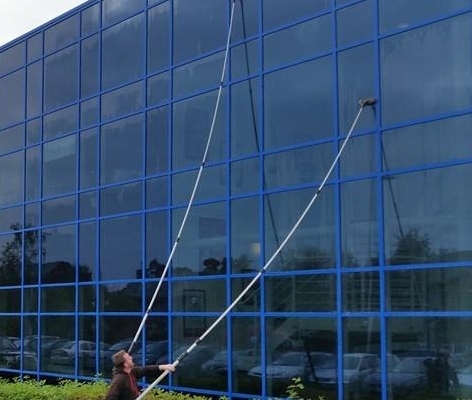 Cleaning windows through a Water-fed Pole (sometimes known as Reach and Wash) is by far the most effective and easy method to operate in an alternative way to clean windows if your looking for a great result, consisting of a long pole with a soft bristled brush on the end, where pure water is sprayed through the soft bristled brush at the end of the pole to remove dirt from the windows. The pure water attracts grime and impurities and the water-fed pole enables the window cleaner to stand safely on ground level to reach inaccessible places. The poles can reach up to a height of 65ft by a specialist trained workman on ground level, the water-fed poles can also be used in conjunction with our Work Elevated Platforms to increase the reachable height. • Access to difficult-to-reach places. • Reduces disturbance to workers in the building. Is more cost effective than alternative methods such as platforms.